You can easily change the reference point for an alignment. I find this useful in my curb return designs. I set the alignment station value to start at the begin of the curb return, this way if I have to add more to the beginning of my curb return alignment the station values through the curb stay the same. 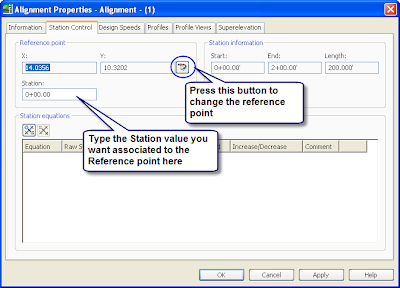 To change the station reference point, go to the Alignment Properties, Station Control Tab. Press the icon next to the Y: value of the Reference Point. When the message box pops us press OK. Then select the new reference point you want the stationing to emanate from. Then if you wish, change the station value to the one you want.